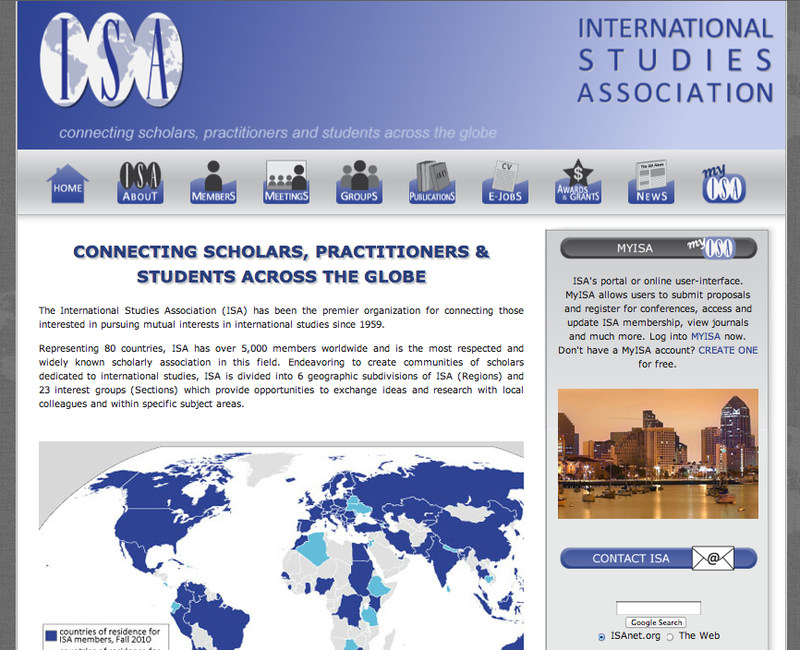 Founded in 1959 to pursue international studies, the International Studies Association (ISA), with its over 5,000 members worldwide, is the most known scholarly association in this field. Member of the International Social Science Council, it has also a consultative status with the United Nations. ISA website provides plenty of resources, from association’s matters such as membership info and application, to news, paper and prooceedings archives. Also blogs and a webresources directory are supplied. Spread out in several sections, the content is organized under a clear and intuitive structure enabling quick understanding of any material provided. ISA promotes six publications: International Studies Quarterly (ISQ), started parallel with the association and its main and oldest journal, International Studies Review (ISR), International Studies Perspectives, Foreign Policy Analysis, International Political Sociology (IPS) and International Interactions (II). Their issues and full-text articles are accessible only by members, while most other content is free and open to the public. In particular, papers and prooceedings of the most recent ISA annual conferences are retrievable and freely downlaodable by all users. ISA website effective design provides a user-friendly approach and an easy navigation, also thanks to effective search facilities. lists a sample of professional transnational, national and subnational Political Science associations. The Web offers exceptional opportunities for promoting associational life at various levels, from fostering publications and research projects to advertising conferences and professional meetings.